Leadership is the single most important human capital issue that organizations face. In fact, in today’s 21st century business, leadership has become a vital element for companies striving to achieve global competitiveness. However, while Leadership can build a team, a department, or an organization, it can also “un-build” or destroy them. A big responsibility has been put on HR to come up with programs that will build the kind of leadership 21st century companies need. Executives are put on a pedestal to meet the increasing demands of a very competitive world. Members of the team are increasingly hedging their leaders as leaders continue to push members to optimize performance. But, a big unresolved issue has been hovering and putting an unclear cut on leadership. In the end, before anything else, we have to resolve what sort of Leadership Behavior should organizations encourage. Is Leadership so contextual that it defies standard definition or development approaches? Should companies concentrate on priorities such as role modeling, making decisions, defining visions, and shaping leaders who are good at adapting? Should companies stress the virtues of enthusiastic communication? A recent research showed that a small subset of Leadership skills closely correlates with Leadership success. 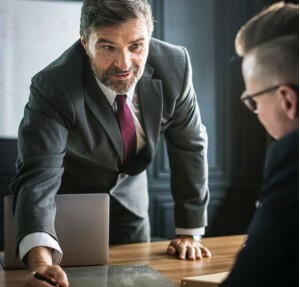 A survey of 189,000 people in 81 diverse organizations around the world was conducted to assess how frequent certain kinds of Leadership Behavior were applied in organizations. A list of 20 distinct Leadership traits was first developed. The population was then divided into organizations whose Leadership performance was strong and those that were weak. Leaders in organizations with high quality Leadership displayed 4 of the 20 possible Types of Leadership Behavior. The 4 Effective Leadership Behaviors that came out prominent amongst 189,000 people explain 89% of the variance between strong and weak organizations in terms of Leadership Effectiveness. 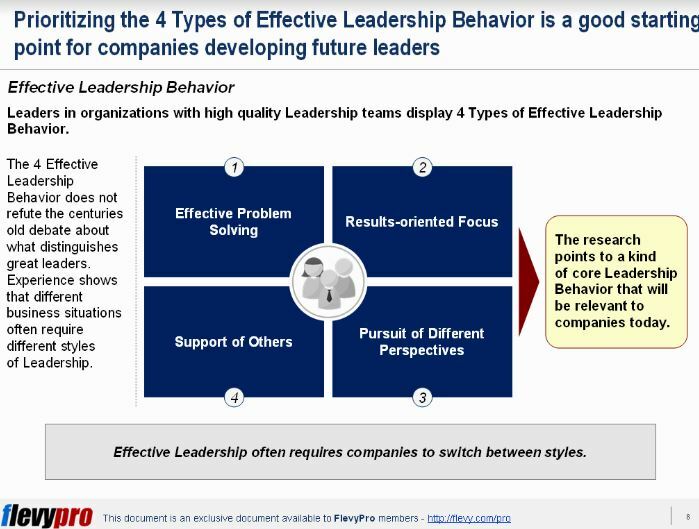 Leaders in organizations with high quality Leadership teams display 4 Types of Effective Leadership Behavior. The 4 Effective Leadership Behavior does not refute the centuries old debate about what distinguishes great leaders. Experience shows that different business situations often require different styles of Leadership. Effective Leadership starts with the ability to solve problems effectively and focus on results. Problem solving is the process that precedes decision making. It is deceptively difficult to get right yet it is a key input to decision making. Leaders must learn to effectively gather, analyze and consider information to come up with informed decisions. Leadership is not only about developing and communicating a vision and setting objectives. Effective leaders must also follow through to achieve results. To achieve this, Leaders must have strong results orientation, emphasize the importance of efficiency and productivity, and prioritize the highest value work. Effective Leaders must consider different perspectives to be able to make decisions that are based on sound analysis. Leaders must avoid many biases to which decisions are prone. This can be achieved when Leaders continue to monitor trends affecting the organization and grasp the changes in the environment. Leaders must be able to encourage employees to contribute ideas that could improve performance. They must be able to differentiate between important and unimportant issues and give appropriate weight to stakeholder concerns. Leaders who are supportive can understand and sense how other people feel. Effective Leaders show authenticity and a sincere interest in those around them. They can build trust, inspire, and help colleagues to overcome challenges and intervene in group work to promote organizational efficiency. Unwarranted fears about external threats are allayed and energies of employees are prevented from dissipating into internal conflict. Having the right Effective Leadership Behavior lays the groundwork for companies to achieve sustained growth. The current Leadership behavior situation of your organization can still be improved. Using the Situational-Leadership Staircase is the way to go. Interested in gaining more understanding on how to develop and hone your leadership skills? You can learn more and download an editable PowerPoint about Effective Leadership Behavior here on the Flevy documents marketplace.